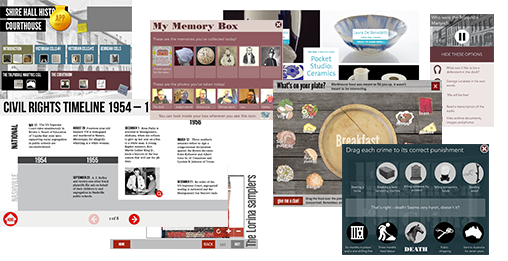 Create your own digital exhibits. Generate income! No programming required! Darwin is our unique platform for easily building touchscreen digital exhibits, mobile apps and digital signage for museums, galleries and other public facing organisations. Darwin runs on Windows, Macintosh, and iOS devices; we can also use it to create exhibits for Android devices. No programming is required! Darwin can generate £1000s for you each year. Try our demos and tutorials. What can I make with Darwin? How easy is Darwin to use? Very! If you can use PowerpointTM or KeynoteTM then Darwin will be pretty straightforward. Create pages and popups, add content and links between them – from a simple interactive to a complicated iPad tour, it’s all possible with Darwin. Creating your digital exhibits with Darwin is a simple, repeatable process. 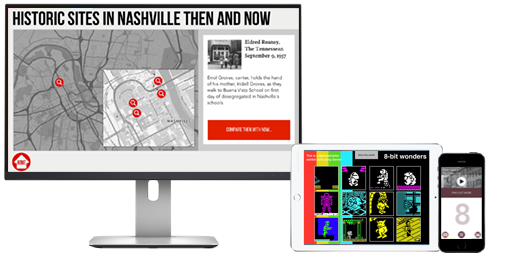 Design, prototype and build your new digital exhibit or app using Darwin Creator, which runs on PC or Mac. If you can build a slideshow, you can use Darwin. Copy your exhibit to a public-facing Mac, PC or download to an iOS device running the Darwin Player app. It’s quick and easy – then you set Darwin to auto-play and reveal it to the public! Change your exhibit – from minor amends to entirely new content and design – as many times as you wish. The more times you use Darwin the better value it is. Your only limit is the number of exhibits you can show at any one time; each licence allows one exhibit. How can I get Darwin? You can try a fully working version of Darwin by using the links below. (Without a licence you will be unable to auto run or upload stories) You can also click here to see more options. If you are short on time, we can build the exhibits for you for a low cost. Most typically we would start creating your exhibit, get the basic design and structure in place, then hand over to you, to complete and then extend and enhance over time. But if you have the time available, you can save more money by building the exhibit yourself. In any case, with your licence/subscription we provide training and support – and it’s lots of fun. Really! With Darwin we have created a wide range of digital tours and exhibits. It is at the heart of our digital offering.